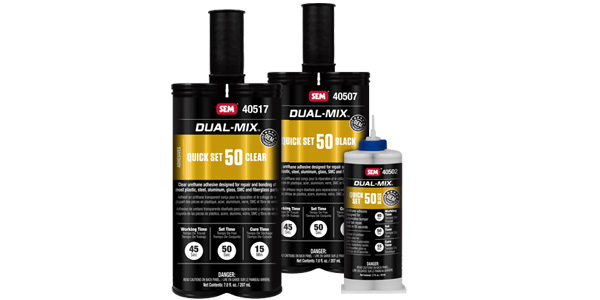 SEM Products, Inc., announced it has introduced the Dual-Mix Quick Set 50 – Clear, a transparent, two-component, urethane adhesive with a 50-second set time designed for plastic repair and general bonding for virtually any substrate. Dual-Mix Quick Set 50 – Clear is ideal for technicians seeking increased versatility, speed and convenience when mounting emblems and trim components, or completing tab repairs and other general purpose bonding. It offers transparent color, a 45-second working time and fast cure that is ready to sand in five minutes. In addition to this new color option, all Dual-Mix Quick Set adhesives now offer an expanded range of suitable substrates, including glass, concrete and wood. Dual-Mix Quick Set 50 – Clear is the newest addition to the market’s most comprehensive cartridge line. Dual-Mix has been trusted for over 25 years, with each cartridge covered by the Dual-Mix Forever Warranty and bearing an OEM recommendation.